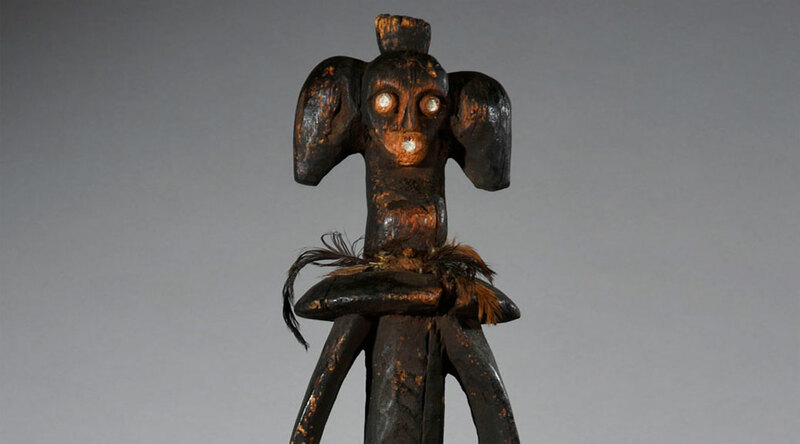 This charming Mumuye iagalagana figure also called ‘peace figure’ was used to greet rainmaker’s clients, guard the house, serve as the owner’s confidant, and in trials when men in dispute swear on the statue. It is not unusual for a figure simultaneously to serve two or more functions. 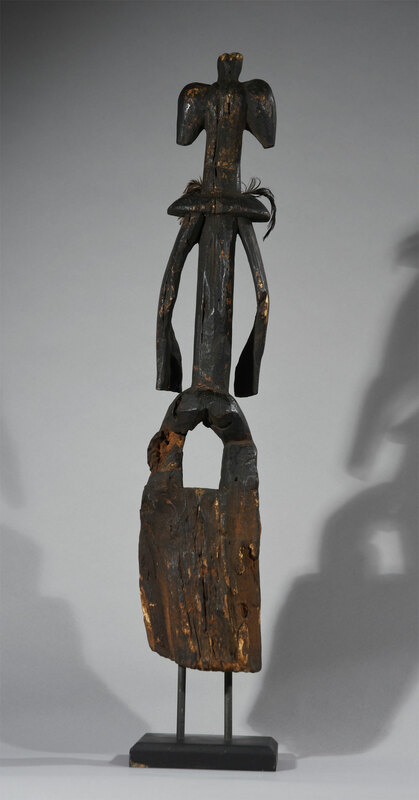 Until the 1970s, most Mumuye sculpture was missattributed to their neighbors the Chamba. With no royal system, the Mumuye are organized by age classes and chooses a village chief that is assisted by a council of elders. The Vabong secret society regulates Mumuye religious life. Entry into the society is achieved through initiation ceremonies. The initiation of boys begins at the age of ten and takes place in a tsafi hut, where the statues are kept. Even though the Mumuye shows great respect for the sculls of the ancestors, their statuary does not depict ancestors, but rather incarnates tutelary spirits. Yet, statues reinforce the status and prestige of their owner who, as he holds them in his hands, has a dialogue with them and thus ensures his personal protection. The functions of sculptural figures are varied. They were used by both diviners and healers, whose professions included diagnosis and cure of ill health and other kind of misfortunes. 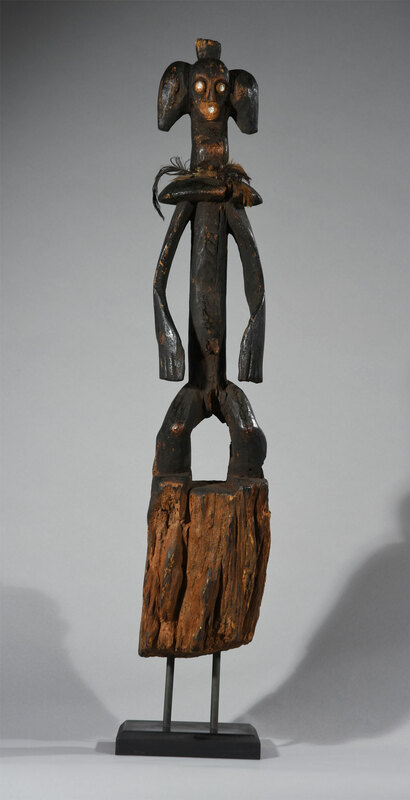 Mumuye figures are highly abstracted, perhaps in part because they invoke forms of human and supernatural authority. This statue is decorated with feathers (like a butterfly) and may have had added elements: beads, belts, bracelets, chains, leather laces, ropes or braided vegetable matter, brass wires, or cowrie shells. The statues’ principal characteristic, unique in African art, is the openwork between the body and the arms, which forms a scroll or a spiral around the slender, cylindrical bust. The legs are acratically angular, and ribbon-like arms wrap around the torso with elbows clearly marked. The heads may as this one display a coiffure in the form of a crest. Dimensions: H: 80 cm. (88 cm. incl. stand) W: 16 cm. Condition: In spite of age in a tropical disruptive climate and termites, this figure is in quite good condition. The parts and shards has not changed the character’s highly artistic quality. Provenience: From a private Danish collection acquired in a gallery in New York 1997. Literature: Francoid Neyt: Mumuye. Published by Gallerie Flak, Paris, 2006.